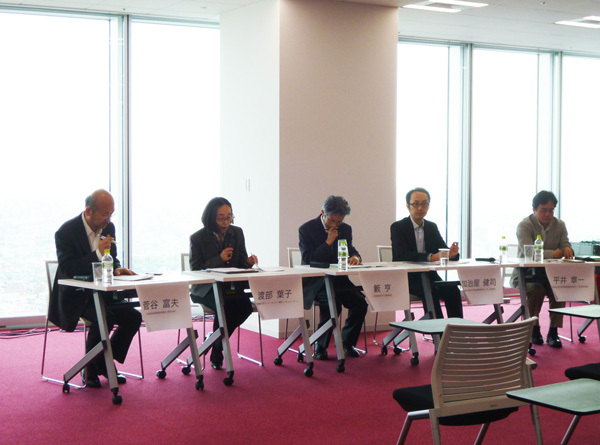 On May 24th 2014, “Art Archives Symposium: Perspectives in Kansai” was organized by JCRI, Osaka Artrip Museum and Osaka Art University at Osaka Art University sky campus, Abenoharukasu. In the symposium, Yoko Watanabe (Professor and Curator of Keio University Art Center), Jun Yabu (Professor Emeritus of Osaka Art University), Kenji Kajiya (Associate Professor of Kyoto City Museum of Art Research Center), Shoichi Hirai (Senior manager of Archive of Kyoto National Museum of Modern Art), and Tomio Sugaya (Senior Researcher of Osaka Artrip) were invited and had a panel discussion after each report. Yoko Watanabe professor and curator of Keio University Art Center mentioned that there is a possibility which archive materials would change over course of time giving Bruce Maclane, who is an artist from Scotland, discussed over the importance of creative use of archives and the necessity of forming a platform connecting archives. On March 11th 1972, when Bruce Mclane’s retrospective exhibition was held at Tate Gallery, and about 1000 work titles were listed including unfinished work apart from the finished work. In 2006, when his private exhibition was held, a live performance called (Throw Away Piece) literally throwing away record photos of the work created by Maclane in the 1960s was taken place. This performance was already prepared in the retrospective exhibition’s work list. The moment when the thrown away record photos were actually thrown by Maclane, it turned into art pieces from archive materials. Hence, archive materials hold the possibility to convert into art. In Tatsumi Hijikata archive which the Art Center holds, many of the visitors of the archives actually dance. One example is that the people who saw the film create the work afterwards. Art Center also reported on three consecutive symposiums in Kanto Area. The importance of archives in art field is been acknowledged, though the reality is that the offer of information to become an archive is not been carried out. Tangibility of the material in order to serve for research, improvement of the accessibility to the materials, creating network, the necessity of the formation of platform was highlighted. Next 4 panelists reported on accomplishment of archive project, which each of them are related. Jun Yabu from Osaka Art University presented William Morris Collection which are stored in the Osaka Art University library. William Morris was a poet, art craft designer, entrepreneur, and a social philosopher and reconsidered printing art and opened his own printing workshop “Kelmscott Press” in the late years and known as modern private print workshop. The matrix of Morris Collection at the Osaka Art University was a collection of one of the England’s potent Morris association member and a collector, Arnold Yates. In the collection,works of Morris related to fine arts and socialism, books related to Morris. 500 pieces of Kelmscott press and its related materials are stored. Morris collection of the Osaka Art University consists from Yates collection and newly added Kelmscott Press 53 books in total and formed further complete collection. 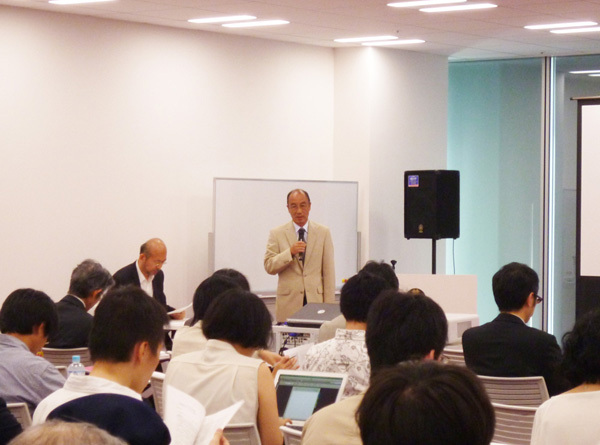 Kenji Kajiya from Kyoto National Museum of Modern Art research center reported the overview and research content and of newly constructed center in April 2014. The center collects and conserves art related materials, carry out research on method towards the use of archive and on the other hand, as an Art University, considers archive as “art resource”, which is useful to the students when creating works and aims as use of archive in education. He also participated in the Japanese Art oral history archive doing research on hearing from Japanese artists, and expose the outcome on the website as oral history archive. The center also develops research on Japanese traditional music,based on score research and construct archives on Kenkichi Tomitomo, Isamu Tsujimoto, and Yasumasa Morimura. Subsequently according to the report by Shoichi Hirai from Kyoto National Modern Art Museum, the actual material of Post war art in Kansai was told. Hirai raised art magazines edited in Tokyo such as “Bijutsutecho”,” Mizue”,” Geijutsushincho” and indicated the current condition, that lacks regional art activities from the post war art history. He also pointed out the situation which post war related materials in Kansai currently especially efemera (exhibition post cards, resume, exhibited lists, site photos, bulletins, and newspaper articles) materials are important materials though not collected nor conserved. Hence, he indicated the necessity of educating people with archival ideas, who can use those materials and the need of facility where collected materials can be conserved. Tomio Sugaya from Osaka Artrip presented the construction of the advertisement material archive of Mannensha. Mannensha is an advertising agency founded in Osaka in 1890, which closed in 1999. The left materials were required by university libraries and company museums but were consequently donated to Osaka City Modern Art Preparing preparation department. At the time, arrangement of materials of all kinds such as posters, proposals, books, commercial videos, TV commercials, digitalized of radio commercials was quite difficult though the starting of the joint project between Osaka City University and Kyoto Seika University triggered material arrangement and construction of archive began in earnest. Up to now, library materials, leaflet, Japanese books, foreign language books were already arranged, and television commercials, radio commercials were digitalized. Currently, Mannensha’s materials can be searched on the website as “Osaka History of Advertisement Mannensha Collection”. In the course of material deposition, research, arrangement and explaining the history up to the opening of the database material know-how and budget of material arrangement, issues of authorizations at the time of opening to the public was pointed out. Today, what archive means would not be a mere collection and conservation of archives. Materials within archives, or archives which seem to be separately are connected, and said that they would be an opportunity of art creation bearing new meaning. Carrying out research of such important archives is one big role. In three symposiums opened in Kanto area up to now, the necessity of the researchers collecting information in order to access to the archives and formation of the platform to share the information was evident.